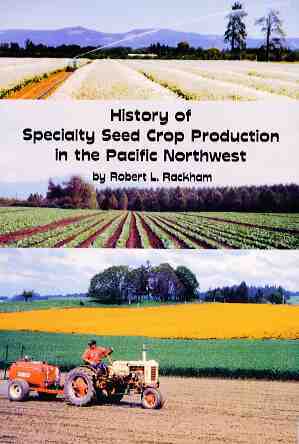 In: History of Speciality Seed Crop Production in the Pacific Northwest by Rackham R L, Willamette Valley Speciality Seed Crops Assoc. (ISBN 0-929332-12-1) p62-7. Evening primrose (Oenothera biennis) is one of those plants for which an economic use is determined and the temporary bottleneck in its commercialization is a reliable production source. The Pacific Northwest was in the right place at the right time with the right resources to become an early production area for evening primrose. In the intervening years, other areas of the world have also become important areas of seed production through the concerted efforts of the commercializing company to 1) disseminate results of excellent agronomic research and 2) create improved varieties adaptable to different growing and economic environments. In the end, much has been learned about the production of evening primrose seed, and markets for the oil have continued to grow. However, today, production has moved to other areas of the world where it can be produced more cheaply. Evening primrose had its beginning as a traditional medicine for the American Indians, who used the roots of the plant as food and poultice-like application for healing wounds. Within the last 30 years, evening primrose oil, containing the essential fatty acid called gamma linolenic acid (GLA), which is extracted from the seed, has been determined to have certain health benefits related to: moderation of blood sugar levels among diabetics, breast pain relief to women with PMS symptoms and fibrocystic breast disease, arteriosclerosis conditions, psoriasis and certain immuno-responses. Consequentially, an alternative health care market has emerged for products developed from a plant only a few years removed from its wild state. A source of raw material had to be developed to meet the demand, and thus, the favorable growing environment of the Pacific Northwest was important to fulfilling this requirement. Evening primrose was produced in the Pacific Northwest mostly during the years from 1977 to 1998. Though not detailed here, production was concurrently trialed in the Midwest (Iowa, Missouri, Kansas, and South Dakota) and the East Coast (North and South Carolina). Based upon the plant being a native of North America, with several species distributed over the upper Midwest and Southeastern states, production areas were designated to determine adaptability, agronomic advantage and seed quality for a crop initially raised as a biennial. (In later years new varieties could be raised as annuals.) Generally, the Pacific Northwest became the preferred production area for many reasons. Following is a brief sketch of each area of importance. The original area for production was in the Skagit Valley, north of Seattle. There, the climate was similar to the English climate, where some production was already in progress. An experience factor existed where small amounts of evening primrose seed had already been produced in previous years for ornamental purposes. Cultural techniques developed in the Skagit Valley were used for the larger production of 25 acres harvested in 1977 by Hulbert Farms at LaConner. Further production was placed in the Skagit Valley during increased market periods of the early 1990s. Advantages of the Skagit Valley were high seed yields and high GLA content attributed to the northerly (long day) cool growing conditions. Disadvantages include seasonal (winter) high-water tables, which proved plants were very sensitive to standing water, and the necessity of artificial seed drying. The following year, 1978, the first planting, a 25-acre field, was placed and harvested in the Willamette Valley on the farm of Jim Butsch at Mount Angel. Subsequently, several hundred acres were grown in the Willamette Valley over the next five to six years both for seed crush for oil and for stock seed production. Advantages include the capability of field drying of seed and the fact that primrose was a good rotational crop with other crops of the Valley. Disadvantages include winter weed pressures on an initially very noncompetitive crop, and disease. Disease problems associated with over-wintering of the crop in moist, but not cold, conditions of the Willamette Valley, tended to drive the production to drier desert conditions east of the Cascade Mountains. Expanding acreage requirements brought primrose to Central Oregon. Here, row-crop production experience existed, but was not well developed. Stand establishment was undertaken with sprinkle irrigation, but difficult because of soil drying and shallow seed-placement requirements. Soils initially had to be kept quite moist until slow-emerging seedlings could establish sufficiently to endure dry desert conditions. Advantages were almost no winter weed pressures and the ability of plants to withstand low overwintering temperatures and late spring frost conditions, generally without disease occurrence. The difficulty of establishing a stand was the main disadvantage. The largest acreages of evening primrose were ultimately grown in the Columbia Basin. Also, under desert conditions, water was generally unlimited and applied by furrow irrigation, which tended to facilitate high moisture levels desirable during emergence. Other row crop experience helped farmers become proficient in crop establishment. Good quality stockseed with strong germination was also produced in the Columbia Basin. Weed control was carefully tended to by a combination of chemical application and hand roguing. Advantages were consistent quality seed production, larger acreage accommodation and favorable stand establishment. Disadvantages were the GLA component in oil was generally not as high as from other areas, attributable to higher summer growing temperatures, and some disease pressure existed, primarily powdery mildew. Limited production was placed in the Grande Ronde Valley, east of La Grande. Both fall and spring plantings were undertaken. Production costs were comparably less in this area, but consistency and yield were often reduced compared to other areas. Evening primrose plants were enduring and took the generally colder temperatures without loss. The cooler temperatures also seemed to enhance GLA levels in the oil. During the 24-year production period when evening primrose was produced in the Pacific Northwest, four varieties predominated. Since each variety evolved, or was built from previous work, large changes in plant type were made in a relatively short time period. Generally, each was an improvement over the previous variety. Bearing in mind that primrose breeding began from wild stock, there were both agronomic and end-product qualities that were targeted improvements. 'Traditional' was the first variety that was primarily derived from selections of the best wild stock. This variety tended to be very tall and indeterminate in its flowering habits, and seed shattered badly - just as the original wild material. Occasional rain or wind would create enough movement, even in the heavy ground swathe while drying, that sometimes as much as an estimated 40 percent of the total crop would be lost from the pods prior to threshing. 'Constable' was the first primary variety used in the Pacific Northwest utilizing breeding techniques. This variety was somewhat shorter and more uniform in height, more determinate, held its seed better than 'Traditional,' and generally tested higher in GLA content, an important improvement for the company marketing oil to the health food trade. 'Merlin' was the next variety to emerge from the breeding program and, agronomically, was a significant improvement over previous releases. This variety was a prodigious producer, generally, exceeding 'Constable' yield by 50 percent. Seed just did not shatter from the plant prior to harvest, but this did make the threshing process somewhat more difficult because of the rather hard pods for which this variety was known. Unfortunately, this variety did not have strong GLA component, and the oil product from Columbia Basin production usually had to be fortified with higher GLA oils produced elsewhere to meet market minimums. The last variety to be grown in any large quantities, was 'PAC-Rigel'. This variety, generally produced under Columbia Basin conditions, provided adequate GLA levels acceptable to the health food and pharmaceutical markets. However, its yield was noticeably lower than 'Merlin,' a point not lost to Pacific Northwest growers, who looked to better yields for profitability. From the 25 acres each year in 1977 and 1978, area of production varied from a few acres of trial plantings and stockseed increase in the early 1980s to nearly 1,000 acres annually during the early 1990s when demand was outpacing supply. Soon after this production peak, international production became a factor, and downward pressure prevailed on both acreages of production and on price. The last year of evening primrose production in the Pacific Northwest was in 1998, when about 250 acres of combined production was harvested by growers in the Columbia Basin and LaGrande areas. Almost all production grown in the Pacific Northwest was shipped to buyers in the United Kingdom. Those shipments exceeded one million pounds annually for 1991 and 1992 crops. Though several other varieties were grown under production trials and limited production increases, none, other than the ones above, saw large and extended production in the Pacific Northwest. One must bear in mind that all the while primrose production was developing in New Zealand and ultimately in China. Today, almost all the production of evening primrose comes from China, where cheap labor and a commitment to export development produces a product of acceptable quality far cheaper than can be produced in this region or probably any other region of the world. The above article is taken from the 'History of Speciality Seed Crop Production in the Pacific Northwest' by Robert Rackham. This book presents a fascinating history of the development of speciality seed crops and is a must for anyone interested in the nuts and bolts of how new crop ventures get off the ground. It covers the reasons why the industry got started and grew, the companies and farmers involved, the crops and varieties used, and many personal insights from the participants. For the crop enthusiast, there are details on sugar beet, evening primrose, meadowfoam (Limnanthes douglasii), and flax, and a whole chapter on the vegetable breeding programmes at Oregon State University. Copies are available at US$ 15.95 each (plus US$ 3.00 shipping) with bulk discounts available.